Disrupting the tick-tock release cadence. Intel today officially took the wraps off Kaby Lake, its 7th generation Core processor architecture that slides in between Skylake (out now) and Cannonlake (due out in 2017). Under normal circumstances, Intel's 10nm Cannonlake architecture would have debuted next, but Cannonlake isn't due to arrive until late 2017. In the meantime, we have Kaby Lake, another 14nm architecture and thus a change to Intel's tick-tock cycle. The new pattern (for now) will be Process, Architecture, Optimization, with Kaby Lake being the "Optimization" for the 14nm node. Which is probably a better sequence than "hickory-dickory-dock." Either way, Kaby Lake gets an official unveiling today with Intel promising up to 12 percent faster productivity performance and up to 19 percent faster web performance compared to Skylake. It's also pushing Kaby Lake as the appropriate choice for creating and editing 4K content, noting that it has the power to do such things up to 15 times faster than a 5-year-old PC (though why anyone would attempt 4K editing on a 2011 PC is beyond us). Before you start making plans to upgrade your desktop, take a breath and relax. Mobile users get first dibs on Kaby Lake. "We are incredibly excited about the strong partnership with our OEM customers and expect more than 100 different 2-in-1s and laptops powered by 7th Gen Intel Core to be available starting in September through this holiday season. 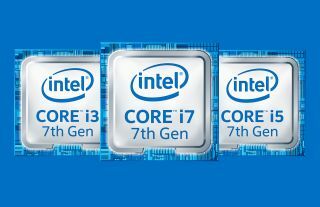 We will share more on the rest of the 7th Gen Intel Core family for desktops and enterprise PCs early next year," Intel said. Looking ahead to what OEMs will do with these processors, Intel says to expect thinner convertibles measuring 10mm, slimmer clamshell laptops checking in at under 10mm, and fanless detachables with waistlines less than 7mm. Intel also promises better gaming performance from the upcoming crop of mobile products. If we're again comparing to a 5-year-old PC, Intel claims a three-fold improvement in games like Overwatch. Intel bases that metric on pitting a Core i5-7200U against a Core i5-2467M in 3DMark's Cloud Gate test. Not that anyone would actually try gaming on an i5-2467M these days. How things really fare is something we'll explore as Kaby Lake trickles into retail.